Vieste (Viestano: Vìst) is a town, comune and former Catholic bishopric in the province of Foggia, in the Apulia region of southeast Italy. A marine resort in Gargano, Vieste has received Blue Flags for the purity of its waters from the Foundation for Environmental Education. 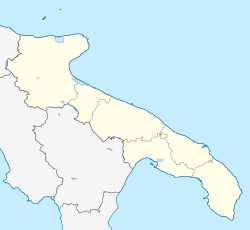 The area covered by the comune is included in the Gargano National Park. In mediaeval times, the port was frequently attacked by pirates, Saracens and other enemies of the Kingdom of Naples. In 1554 around 7,000 inhabitants were enslaved by the Turks, with those being deemed too elderly or infirm to merit transportation into slavery executed. This event is commemorated annually in a ceremony. The town is bordered by Mattinata, Monte Sant'Angelo, Peschici and Vico del Gargano. The coast is interesting from a geological point of view. Next to the town there are two large, straight beaches. The rest of the coast is made up of gulfs and small, hidden sandy beaches. Erosion by water and wind has shaped the calcareous rock into grottoes and arches. Since the coast is steep, some of the finest sights can be reached only by sea. Until a few decades ago, its main resources were fishing and agriculture. Now tourism, with hotels, resorts and camping facilities, has transformed the town's appearance, economy and lifestyle. a castle, with a triangular shape and bastions at its vertexes. the Co-cathedral in Apulian Romanesque style. It has a basilica plan with a nave and two aisles. Its bell tower was rebuilt in Baroque style in the 18th century after the previous one collapsed. ^ a b Syed, Muzaffar Husain; Akhtar, Syed Saud; Usmani, B. D. (2011-09-14). Concise History of Islam. Vij Books India Pvt Ltd. ISBN 9789382573470. Wikimedia Commons has media related to Vieste. This page was last edited on 11 September 2018, at 07:23 (UTC).